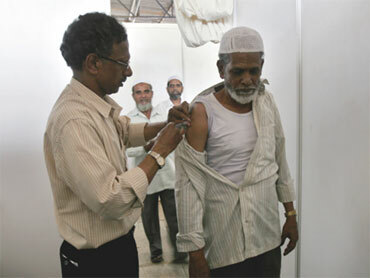 Will the Hajj be an Incubator for H1N1? The following story is from GlobalPost correspondent Carlye Murphy in Rihadh, Saudi Arabia. As millions of Muslims begin arriving in Mecca for this year's pilgrimage, Saudi officials face a unique challenge: how to prevent this sacred rite from becoming an inadvertent incubator and global transmitter of swine flu. An estimated 2.5 million people from up to 160 countries — including perhaps 15,000 from North America — will walk, pray and eat in close proximity to each other for several days. They will touch the same religious objects and sleep in crowded tent cities. Some, inevitably, will arrive carrying the new virus strain, H1N1. Unable to alter these conditions, Saudi health officials have been working feverishly for months to minimize the risks. It has been a delicate balance between maintaining unrestricted movement for one of Islam's holiest rites, and imposing measures to retard rampant transmission of the virus. Al Marghalani said in an interview that ministry officials "feel very confident" that they have done as much as they can to prepare for the hajj. One recommendation, which the Saudis adopted and Arab health ministers endorsed, was for high-risk people to avoid this year's pilgrimage. That group includes those younger than 12, older than 65, pregnant women and those suffering from diabetes and chronic diseases of the heart, kidney, lungs or nervous system. The Saudis stress this is advisory only. "We will not prevent anybody from coming in if they get approval from their country," said Dr. Ziad A. Memish, assistant deputy minister for preventive medicine, in a recorded interview posted at the Web site of Science magazine. The hajj, which lasts four to five days, is one of Islam's five pillars, required of all physically and financially-able Muslims. Each country is assigned a quota of hajj visas that it receives from the Saudis. The kingdom has received an initial shipment of swine flu vaccine, and next week will start vaccinating health workers and local residents who plan to attend this year's hajj, Agence France Presse reported Monday. Thermal sensors at airports will detect arrivals with a high fever. The Saudi health ministry "has recommended that each receiving airport have the holding capacity for 200 to 300 pilgrims to evaluate those who are symptomatic with influenza-like illness," said the June workshop report. But officials are avoiding any mention of "quarantine," the report added, partly because of fears it would discourage ill pilgrims from coming forward, and partly because of the "risk of politicizing Hajj negatively as people may feel discriminated if quarantined." While the prevention effort this year will be more intense, it is not unprecedented. "We have had experience with communicable and non-communicable diseases during the hajj for more than 50 years, so we've got a lot of experience," Al Marghalani said. Also, the government issues a yearly report summing up the major health issues of the last pilgrimage. "They are very transparent," said Awad Abu Zeid Mukhtaar, WHO's representative in Riyadh. "Whenever they have cases, they report it."